January 13, 2017 by Fr. C.
Over the years, I have collected a great many books and pamphlets from the earliest phases of the Anglo-Catholic movement here and in Great Britain. These were small enough to carry in a coat pocket and sufficiently inexpensive to entice even the most penurious. One could read important, albeit brief, thoughts about the faith while commuting or even walking. They needed no batteries to power them or wi-fi connection, but good reading glasses were necessary for some of the smaller typefaces. The great tragedy, particularly with respect to teaching pamphlets and tracts, our apologetic began to gather dust on tract racks. Eventually, these gems were relegated to a jumble in store room boxes, or worse, pitched out with the rubbish in favor of brightly colored adverts for cheery social justice themes, in-church raves, and providers of “wymyn’s health services”. Perhaps the best of these cane from the great Anglo-Catholic Congresses and the spiritual and intellectual giants of the day-Darwell Stone, Francis Hall, and others. In a few words, they gave a mind to the movement and provided precis if their larger and important works. In the spirit of returning to our Anglo-Catholic “roots”, I have begun to scan and edit some of the surviving materials for a modern presentation. In the meantime, with the exception of some dated references, the documents still teach and exhort, so I will put them up here to get them out and circulating once again. The first of these pamphlets is Reservation of the Blessed Sacrament by Darwell Stone, D.D., Principal of Pusey House, Oxford. It was No. 28 in a series entitled “The Congress Books” edited by another great, Leonard Prestige for the Society of Ss. Peter and Paul, London. Published in 1923, it originally ran to 15 pages. The price from a used bookseller was USD10.00 some 5 years ago, and worth every penny. It is offered here for your use and dissemination. Copies of the original in .pdf with the artwork are available from stirenaeus@hotmail.com, and we hope that paper versions will be republished in the spring. The custom of reserving the Blessed Sacrament of the body and blood of our Lord and Saviour Jesus Christ was due in the first instance to the practical needs of the Church. And through all the later history of the practice the necessity of receiving grace and the gain by progress in spiritual life have been in view. The solemn words of our Lord, ‘ Except ye eat the flesh of the Son of man, and drink his blood, ye have not life in yourselves ‘ (St. John vi. 53) have been understood in the Church as at least including a reference to the Blessed Sacrament. In consequence one chief duty of the Church’s ministers has been to secure opportunities of Communion for all those who may rightly receive it, whether in health or in sickness, whether during life or at the point of death. The provision of the First Ecumenical Council that a wide and generous indulgence should secure for the departing Christian in all right cases the reception of the last and most necessary Viaticum is but one instance of what the Church has always felt. In the first ages of the Church there were different groups of persons who, if they were to receive Communion, had to receive it in some other place than that in which the Sacrament was consecrated. There were the sick and dying; there were those who were kept away by necessary occupations; there were those who were in prison, who during the times of persecution included many whose only offence was that they were Christians. In the altered circumstances of Church life there have been at all times corresponding groups. The needs thus existing have been met in different ways. One method of administering Communion to those absent from the place of consecration has been by carrying the Blessed Sacrament directly from the celebration. In the middle of the second century there is record that after the Communion at the celebration the Sacra­ment was carried to those who were not present. A like provision was made as one of two alternatives in the English Prayer Book of A.D. 1549 and in the Latin Book of the English Church in A.D. 1560. In the last few years this method of giving Communion to the sick has often been practised in the English Church, the Sacrament being taken sometimes immediately after the service, sometimes after a brief interval, during which it has been reserved in church. A second method of meeting the need has been by continuous reservation. In the early Church individual Christians were allowed to keep the Sacrament in their own houses for their Communion daily or from time to time. Later this custom fell into disuse, probably partly through the cessation of persecution, partly because Communion became ordinarily less frequent, partly because, as the Church grew, it would be difficult to prevent abuses if such a custom continued. A somewhat dif­ferent method was that by which the Sacra­ment has been reserved in the house of the priest. Possibly this existed in some instances in the early Church. It has been frequent among Roman Catholics in Ireland because of the distance at which the priest often lives from his church and the consequent danger of sacrilege and risk of delay in giving Com­munion to the dying if the Sacrament were in the church. The Irish Roman Catholic bishops possess faculties from the Pope by which they are allowed to give leave to priests to reserve the Blessed Sacrament in their houses. But the ordinary place of continuous reservation has been the church. There are instances of this from Africa in the fourth century and from Constantinople in the fifth. This has been the unbroken practice of the Eastern Church since the first centuries, of the whole West until the sixteenth century, of the Church of Rome since the sixteenth century. In the English Church this practice fell into disuse in the sixteenth century; it was re­vived by the Nonjurors in the eighteenth century; it is the traditional method of the Scottish Church, and during the continuance of the penal laws from A.D. 1746 to A.D. 1792 probably most Communions both of the whole and of the sick in Scotland were made from the Sacrament so reserved ; and during the last thirty years of the nineteenth century and in the twentieth century it has been restored in many English churches. A third way of meeting the need has been by consecrating the Blessed Sacrament in a private place. Of this method there are some occasional instances in the early Church, all apparently for some special reason. Apart from particular circumstances it was dis­couraged, and in the fourth and following centuries was forbidden. It was one of the two alternatives allowed in the English Church in A.D. 1549 and A.D. 1560 it was the only plan mentioned in the Prayer Book of A.D. 1552 and the later English Prayer Books; and it became the ordinary method in the Church of England, with the result that what had been exceptional in the early Church became usual, and what had been usual became exceptional. The foregoing brief summary of historical facts opens the way for considering the practical needs of the English Church at the present time. These are of different kinds. The giving of the Communion to the sick and dying is an anxious concern to the parish priest. Communion can be given more fre­quently to many chronic invalids if the re­served Sacrament is available. For many of them, and perhaps for most of those seriously ill, there will be less physical strain and more spiritual profit if they receive the Sacrament without a celebration at the time. At any rate, in large parishes a serious attempt to give Communion to the dying in all right cases will involve reservation. If the circumstances of the great war emphasized the need of reserva­tion in military hospitals and at the front, they only brought to wider notice, and laid a greater stress on, what had long been well known to many parish priests. Again, emergencies through sudden dan­gerous illness and through accident are frequent. In many or most of such emergencies a cele­bration is out of the question. If in them Communion is to be given, it must be from the reserved Sacrament, and, it may be added, from the reserved Sacrament not in some distant neighbourhood but close at hand. Thirdly, there are classes of persons for whom Communion is difficult or impossible at the ordinary times of celebration in church. Two obvious instances are those of hospital nurses and people engaged in agricultural work. Probably few except priests with knowledge of country life have any idea how many of those whose work has to do with cattle and the land fail to communicate from year to year much more because they have not oppor­tunity than because they are alienated from the Church. The possibility of giving Com­munion from the reserved Sacrament in the church to those who cannot come at the times of celebrations removes a most serious diffi­culty in practical work. In the circumstances of to-day the practical need for reservation may well be greater than at any earlier time. If some kinds of violence are less than they once were, the massing of population in great towns and a new preva­lence of accidents are among the causes which increase a need always great. Consequently, the principle which underlay the practice of the past has increased force now. This prin­ciple was that the priest should always be able to give Communion to those who ought to receive it. The regulation of the Excerpts of Egbert in the eighth or ninth century “that the presbyter have the Eucharist always ready for the sick, lest they die without Communion” is a representative instance which shows the mind of the Church in its care for souls. If the Church at the present time is to be no less careful for the spiritual needs of its members, provision must be made that the Sacrament be always at hand, lest either the whole or the sick be deprived of their due. The custody of the sacraments in his parish is given to the parish priest at his institution; and it is his duty to see that he does not fail in any right care for the souls committed to his charge. The Blessed Sacrament then is to be reserved in the parish church. In the treatment of it, again, there is a principle of present value contained in the regulations of the past. The Sacrament thus reserved is no other than the Sacrament which is on the altar after the con­secration in the Mass. It is the body of the Lord; it is the presence of him who is our God as well as our Saviour. This sacred and divine presence may not be treated as a common thing. The honourable place, the locked taber­nacle, the beautiful pyx, the fair veil, which old English regulations required, simply gave effect to the truth that what is reserved is the body of Christ. The custody of the Eucharist, being an integral part of the cure of souls, is shared by the bishop of the diocese and the parish priest. It is the duty of the parish priest to reserve the Sacrament in the parish church for the purpose of Communion as described above; and it is the right of the bishop to make regulations concerning the method of reser­vation, in order to ensure due security and reverence, and also to decide whether the Sacrament may be reserved in churches and chapels other than the parish church, or not. There is a further consequence of the truth that the reserved Sacra­ment is the body of Christ. Wher­ever the Lord manifests his presence he makes a demand. The soul of the Christian can at all times and in all places worship the incarnate Lord in his heavenly glory on the throne of God, just as at all times and in all places there can be worship of the Holy Trinity, Father, Son, and Holy Ghost. But the sacramental presence is a special manifestation of the Lord, and calls for a special response. Such a response is to be made by the worshippers at the offering of the Eucharistic sacrifice; it is to be made also by any who draw near to the reserved Sacrament. In all the gifts of God there is a claim made on the soul of man. But the work of God does not end when he asks for worship, for love, for surrender. In his care for mankind, he links together the soul’s response to him and the soul’s own good. The adoration in the Mass strengthens the soul against temptation and for duty, and helps to equip it for the service of God. The worship of the Lord in the reserved Sacrament aids thanksgiving for Communions already received, enriches pre­paration for Communions which are yet to come, strengthens the sense of the abiding presence of God throughout his universe and the lasting union of the incarnate Lord with the Christian soul, is a means to deeper peni­tence and firmer resolve, and a stay for con­stant prayer. It is one of the resting places in the Eucharistic life of the devout com­municant; and it has appealed with a singular force to some who from sin are finding their way back to God. Prayer before the Sacrament might help the soul even if the Sacrament were only a symbol. Even so, it might recall the memory of Christ, as the crucifix recalls his death for us and a picture recalls the fact of his incarnation. But, when it is acknowledged that the Sacrament is not only a symbol but also the living pres­ence of the Lord himself, then there is a special claim on the soul’s allegiance and a special gift for the soul’s life. Prayer to the Lord in the reserved Sacrament has its own meaning for the servant of God. The devout use of the reserved Sacrament is very prominent in the present practice of the Church of Rome, inheriting a long tradition of Western Christendom. To enter a Roman Catholic church for prayer is naturally associated with, though not wholly confined to, the incarnate Lord in his Sacrament. 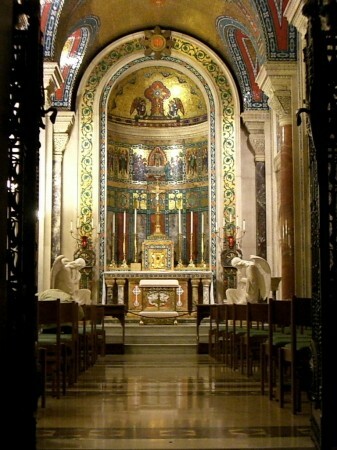 In addition to the private prayers of indi­viduals, services of common worship are frequent among Roman Catholics. There are processions in which the Blessed Sacrament is carried as an act of faith and reparation, to elicit the adoration of the faithful and to seek the blessing of the Lord; there is exposition in which the Blessed Sacrament is shown to the people in the monstrance that they may worship and pray; there is benediction in which the people are blessed by the priest holding the monstrance containing the Sacra­ment. In part these forms of devotion follow practices current in the West during the Middle Ages; in part they are due to the Counter-Reformation of the sixteenth and seventeenth centuries. The extent to which they are used differs considerably in different parts of the Roman Catholic Church; by some Roman Catholics they are but slightly valued, while from others they draw out great en­thusiasm and love. The last ninety years have seen a great transformation in the Church of England. The many changes which have taken place have had their centre in the Eucharist. The restoration by the Tractarians of a Eucharistic doctrine which was well-nigh lost led by a natural sequence to many changes in practice. Celebrations which had been infrequent became frequent. In many places where three times a year or once a month had formed a standard, one celebration or more daily have become the established custom. In many places the Mass, from being almost out of sight for the general congregation, has come to be acknowledged as the principal service. Where Communions were made by tens they are now made in great numbers. And step by step there has come to be a widespread recognition of the need for the reserved Sacrament and for its devotional use. In accordance with English descent and associations the development in the use of the reserved Sacrament has naturally proceeded on Western lines. Not unnaturally, too, some in the Church of England whose Eucharistic doctrine is without suspicion, have felt the tradition of Eastern Christianity to afford a reason against the adoption in the Church of England of practices distinctively Western. It may well be that for some time to come not all who are agreed as to Eucharistic doctrine will be altogether agreed as to its results in practice. At any rate, there is room here for a wide and a wise toleration. The fatal mistake would be to mar spiritual life by wrong ways of controversy or to crush it by a wrong rigidity. In every restoration of what has been wholly or partially lost there are dangers. There is the danger lest enthusiasm for what is regained may tend to obscure what has always been possessed. There is danger lest the balance and proportion in thought and worship and life be not rightly preserved. There is danger lest the very intensity of some movements of the soul may hamper or dwarf or make unreal other not less needed sides of life. No religious progress can be free from dangers such as these. It may not be expected that the stirring of life in the English Church can be without them. But the dangers are to be met, not by abandoning what is true and right but by seeing that it is in its proper place and that it has its proper complements. A great responsibility rests on all who value the reserved Sacrament. If stress has been laid in this paper on reservation as the duty of the priest and on the devout use of the reserved Sacrament as the response of the Christian to the claim of our Lord, it is because the writer believes that these are among the aspects which ought to be emphasized. To the priest the custody of the Sacraments is a very solemn thing. To the lay people the approach to the reserved Sacrament is only less solemn than the approach to Communion and the offering of the sacrifice. As this solemnity is recognized, the reserved Sacrament may take its place in the whole sphere of Christian life. For it will be seen that the Christian life is a harmony in which the outward is supported and sustained by the inward, and the inward by the outward, and in which both outward and inward share the task of promoting the imitation of Christ.